When it comes to unusual and personal home or office floor options, often the solution is right under your feet. If you are looking for a unique way to make your rooms stand out, it would be hard to beat the impression acid stained floors make. 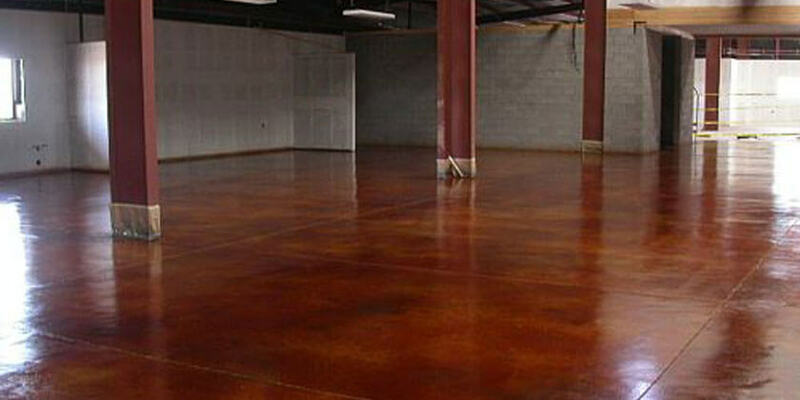 Stained concrete floors are fun, funky and functional, and a great alternative to wood, tile or carpeting. Easy to clean, easy to maintain, and beautiful as well. That translates well to countertop applications. 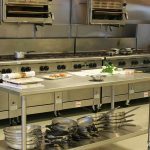 Stained concrete flooring has been around for quite a while – the Ahwahanee Hotel in Yosemite National Park sports them, and they are still popular with designers and architects today. Popular with architects who promoted the Arts and Crafts movement of the early 1900s, they still fit in with modern architecture, due to their sleek nature and urban aesthetic. Stained concrete counters are easy to clean and maintain, making them perfect for both home and office applications. They mesh well with a variety of architectural styles, from hi-tech to trendy to formal. 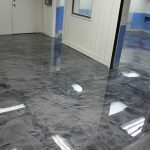 The stained concrete floors we do for homeowners and businesses, are created by using chemicals to give concrete a permanent and totally unique color, and countertops are created the same way. Because the stain is translucent, it adds a definitive patina to the surface. Concrete staining isn’t about perfection – the goal is to preserve the character and beauty of the individual concrete. Cracks, trowel marks and imperfections become a part of the surface’s natural beauty. Creating stained concrete floors and counters is an art – there are a variety of different color combinations to choose from, each of which can achieve a different effect, from modern industrialist appeal to old world beauty to a natural, rugged, outdoor feel. One of the perks of concrete staining is that it is easily customized. It can be decorated with colored grout, specific designs, and saw-cut patterns. 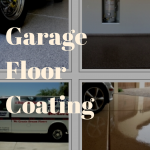 Once colored, they are finished with a protective high-grade acrylic sealer that enhances the appearance and protects the flooring. Why should you call Dreamcoat Flooring if you are considering re-doing and beautifying your concrete? Our customers say that it is durable and practical. When weighing design options, it’s hard to beat the long-term, low maintenance, beauty and aesthetic appeal that stained concrete flooring and countertops offer. Call 480-226-4172 our office now to get a FREE floor estimate and design consultation to help you decide if acid washed concrete floors are for you!